On Tuesday 14 March 2017, Father Joan Lena successfully defended his PhD thesis at the Protestant Theological University (PThU) and he can now call himself a Doctor of Theology. 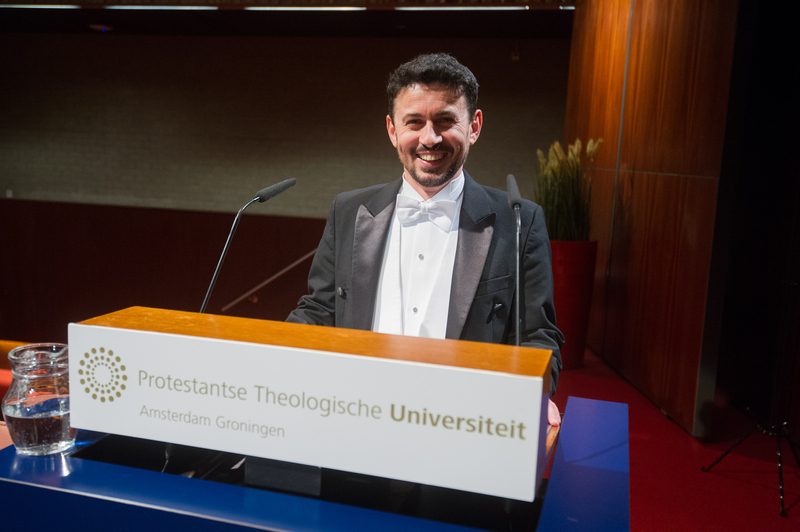 Dr. Lena defended excellently and with humor his PhD thesis with title The Panegyrikon Codex Type and its Liturgical Function: A New Model Catalogue, in the central hall (Aula) of the Vrije Universiteit Amsterdam. You can find a short presentation of the topic at the following link: https://www.youtube.com/watch?v=ad0M0ymZHj0. Deacon Joan Lena started his work as fourth ACOT staff member on 1 March 2017. As lecturer in Orthodox liturgical theology he will lecture in, amongst others, the pre-master programme. On the same day one of his two co-supervisors, prof. Theodora Antonopoulou, gave a guest lecture on the following subject:“Religion and beyond: Homilies as Conveyor of Political Ideology in Middle Byzantium (8th – 12th cent.)”. Prof. Antonopoulou works at the Department of Byzantine philology and folkloristics at the University of Athens.